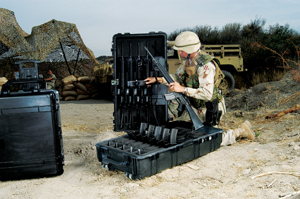 For weapons cases designed to hold multiple guns, UFP Technologies can outfit larger cases with foam inserts and other restraints. Whether you’re transporting your gun to the range or to a hunting trip on another continent, utilizing a protective case with a foam insert is the best way to achieve peace of mind. At UFP Technologies, we work extensively with Pelican Cases to provide gun cases that are watertight, crushproof, and compliant with most airline regulations. The open cell core with solid wall design creates an extremely strong yet lightweight case and each Pelican case comes with an unconditional lifetime guarantee. For custom foam inserts, we will need a simple outline of your gun along with any magazines, sights, scopes, ammunition holders, or other accessories that you want included.